Because you never know when the next one comes along. Some philosophers say that the only true moment of contentment is the present, because you cannot worry about the future or have regret about the past. Galwaypeople and fans of Galway hurling, breathe in this feeling of success. Breath anything, just breath after that whirlwind final that started off promising so much, and then developed into a nip and tuck classic that left the result in doubt until late on, when the destiny was resurrected in a final drive by Galway to wrestle back control of a contest that seemed to be edging away from them. And so Galway are champions. Is this what it felt like in the past? 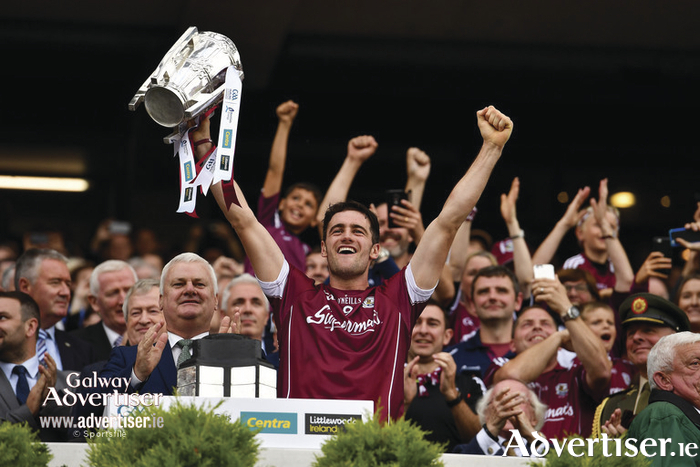 Maybe tomorrow you will be able to enjoy it more, when it sinks in, when you wake up and hear the morning sports news and listen intently just to confirm in your head that Galway are indeed All-Ireland champions. For the players, it hasn’t sunk in yet — nor may it for months or years. Right now, their emotions at the match are mixed up in a cocktail of relief and tiredness and camaraderie. Aftwards, Joseph Cooney said that he is still distilling the match in his own head. “It’s such a feeling of relief. We came in at half time having done all the hurling, and yet we were only a point up. However, the training we had, prepared us for instances like this. The lads in the group took great ownership and they had four or five core messages that we adhered to. They had placed great trust in us, all of us and it call came together. “At the start of the match it was such a boost to see the entire 34 squad members all togged out for the team photo. That had never been done before with us, but it highlighted the extent to which this was a complete squad victory and not just the first fifteen. We were all like in a bubble going in the one direction. We knew that we could never let the heads drop no matter what happened. “So it’s hard to describe how I’m feeling at the moment apart from an overriding joy. This is everything I’ve ever dreamed of. We put our lives on the line for this campaign and it has paid off with this victory,” he said. Manager Micheal Donoghue said that the secret of this success has been down to the resilience and the character of the entire squad. He said that there had not been any specific message delivered to the players at halftime. “We felt we had been doing OK. Just we might have wanted to increase our workrate and shape, and they took it all on board and they showed a great desire to finish the job. “We had the players who were capable of shooting like they did, when the game was nip and tuck in the second half. “This was a victory which had its origins in those league games against Wexford and Waterford when we learned so much, and when the players took ownership of their destiny. They had real connectivity after that and you could hear in the vocals between them, in their encouragement of each other,” he said.